I would like to switch to a Blue/Black ink. I like Black because it shows up and is acceptable for document signatures. I would like to use a blue/black but most I have seen are a little lighter, lean to the blue side, than I would expect. What is your recommendations for a dark, leaning towards black with a indication of blue, but not black Blue/Black ink? I know I am being picky but just looking at pictures is difficult and purchasing all the samples is expensive. Your comments are welcome. 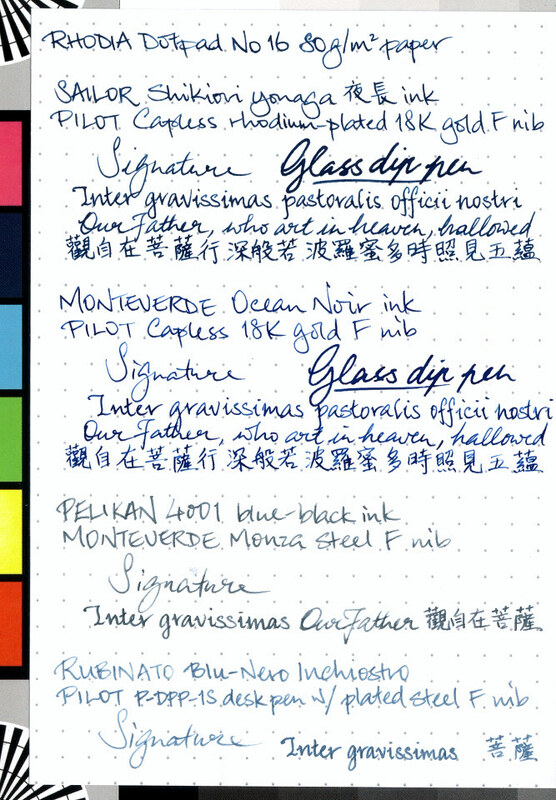 I have a number of blue black inks, many of which I like. One that I’ve had inked in a pen continuously for the past two years is Noodler’s Blue-Black. It’s close to black going onto paper, and dries so the blue is definitely visible, but is still more black than blue. It’s very water resistant, forgery resistant, and partially “bulletproof” (click on link for details on properties of Noodler’s ink-http://noodlersink.c...ink-properties/). For me, it has been well behaved, even on inexpensive papers, and I have had no issue with my pen or nibs using it despite its continued inking in a Lamy Safari. Other blue black inks I like (but without the resistant qualities of Noodler’s BB) would include Pelikan Tanzanite, and Pilot Shin-Kai. An ink I bought as a Blue-Gray is Robert Oster’s Summer Storm, but after finding it to be a dull color that wrote drily in most pens I tried, I dipped a toothpick in Dawn dish detergent, then dipped it in a sample of Summer Storm. It became a beautiful Blue Black in medium and broad nibs, and is now well lubricated and a delight to use for me. Good luck with your endeavor. 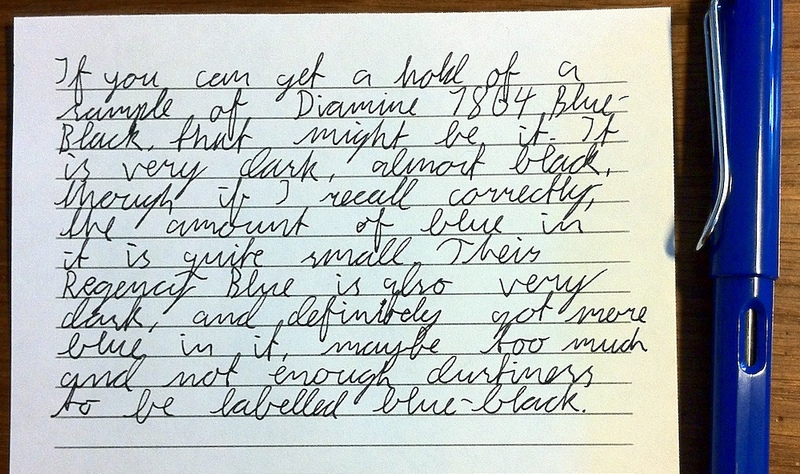 I like Diamine Blue-Black and Diamine Denim - Denim is slightly drier than Blue-Black, although both are quite wet inks. Nice flow and lovely colours. Like Herrjaeger, I also think Pelikan Edelstein Tanzanite will work for you. It's a very dark blue black. Thank you for your responses. I will look at each of your recommendations and see what I can come up with. I only want it for open that I would use for my signature. Have a great day. If you want super dark, also have a look at Diamine Eclipse. But I'm becoming more and more fond of Edelstein Tanzanite, because -- unlike a lot of blue-blacks out there -- it doesn't lean teal. ETA: Another couple I'd recommend would be KWZI IG Blue-Black and IG Blue #3. Edited by inkstainedruth, 15 October 2018 - 23:56. I've quickly become a fan of Monteverde Ocean Noir. Really a great color and behavior. However they do not list or compare MB Midnight Blue or Pelikan 4001 BB which are both worthy contenders. 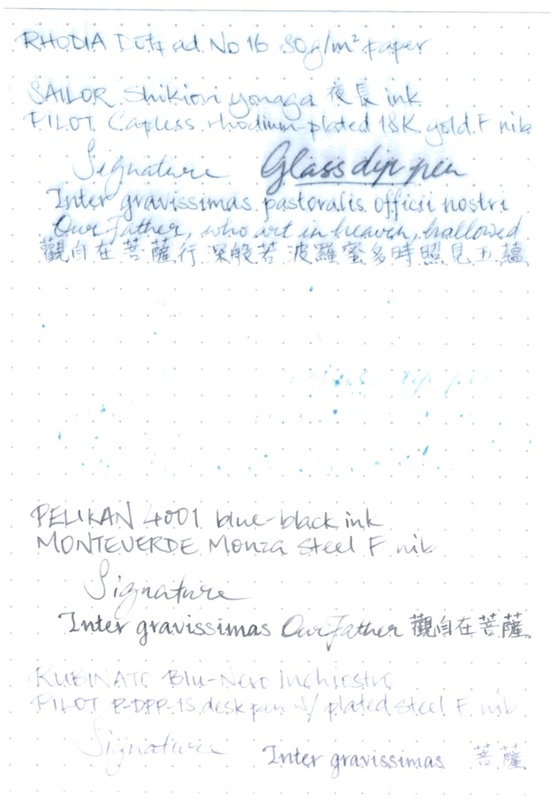 Ive never tried the Pelikan Tanzanite, but now I’m interesting seeing that one. When I read what you were looking for, I immediately thought of Noodler’s Ellis Island Blue Black. However, I tend to prefer my blue blacks to shade a bit green. My fave is Noodler’s Air Corp blue black and Noodler’s Legal Lapis. However, when I’m using a vintage pen and I need b/b, it is almost always vintage Sheaffer Skrip Blue Black (interestingly, I do not own a bottle of modern Skrip blue black so I have no idea how it compares to the greenish tinged qualities of the the vintage). I’m now going to keep an eye out for that Pelikan. Thanks again for all the informative recommendations and comments. This should keep me busy, and broke, for quite some time. I have been successfully experimenting with making a homebrew Parker Quink blue-black by mixing five parts of blue with one part black. I did this because the current formulation of blue-black Quink is too teal in color for my taste. And having the components on hand, I also mixed a homebrew Pilot blue-black using the same proportions with Pilot blue and black. It didn't come out the same as the Quink homebrew; it's lighter in tone, but quite satisfactory — and different from the manufactured Pilot blue-black. I like your experiment so much I think I will give it a try. In any case it would certainly be unique. I'm a big big fan of Pelikan 4001 Blue Black. I keep it in my 140. I also like Diamine Blue Black. I don't often use my bottle of Noodler's 54th Massachusetts. I should add that I use vintage pens (a Vacumatic, a striped Duofold) almost exclusively, and I'm leery of running heavily pigmented modern inks through them. Hence the focus on Quink and Pilot. But as others have mentioned, if that's not an issue then you'll find a great variety among the inks from Noodler's and Private Reserve and lots of others. That Jetpens comparison mentioned above is good, although it was compiled a while ago and the market has added some inks since. Edited by AreBeeBee, 16 October 2018 - 23:30. I'm also a big fan of this ink, for its deep color and good behavior like most other Monteverde inks. 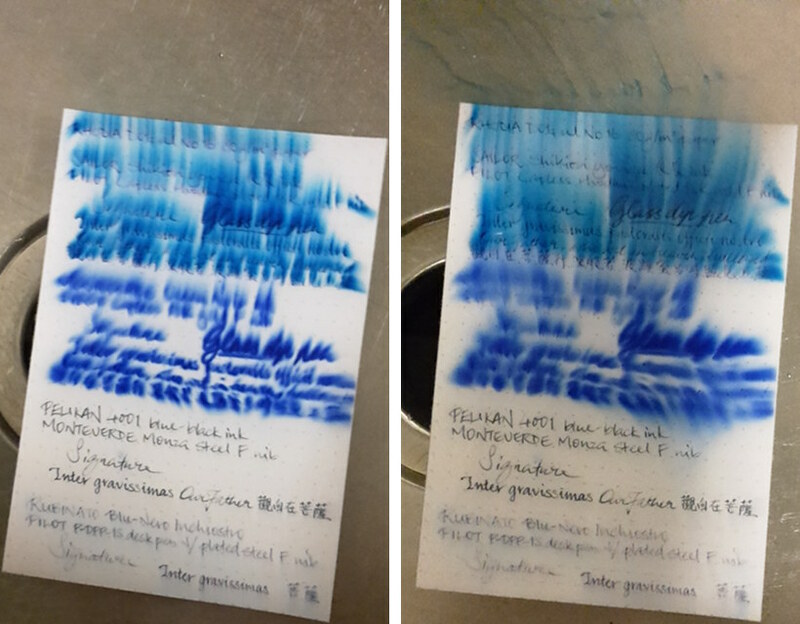 It's worth noting though this ink qualifies as a blue-black, it is actually blue with black undertones, like other members of Monteverde's "Noir" ink line. For a blue-black that leans more towards black, Aurora Blue-Black is worth considering. Its only flaw is that it can dry out in some pens. WOW, so many excellent choices and so little time. Thanks for the comments and recommendations. I'd suggest Sailor yonaga in the Sailor Shikiori line of inks. Perhaps that's a consideration, since your primary use case for the ink is signing your name on documents. I was in the same quandary, everything I looked at was too blue. I decided to give Sailor Kobe #51 Kana-cho Midnight a go and couldn't be happier - very dark (some say too dark) yet not quite black. Was a bit of a hassle ordering it from Japan but I believe Vanness carries the Kobe line now. The new Sailor Yonaga is also very nice and very dark but it only comes in the new 20 ml bottles, so a little pricey. Whenever this question comes up, I suggest the original first-Blue-then-Black, which is too long and shortened to Blue-Black. A nice Iron Gall ink, like Diamine Registrar, or ESS Registars. Others like R&K Salix. Ruth mentioned the KWZI iron gall inks but I dunno how to order those.